The official refused to comment on quality of work. Hyderabad: The Hyderabad Road Development Corporation Limited has left city roads to the dogs. The corporation, which built 100 km out of total 320 km in eight months, left the roads with craters and potholes at several places. In the absence of a grievance redressal system, citizens have been bearing the brunt. 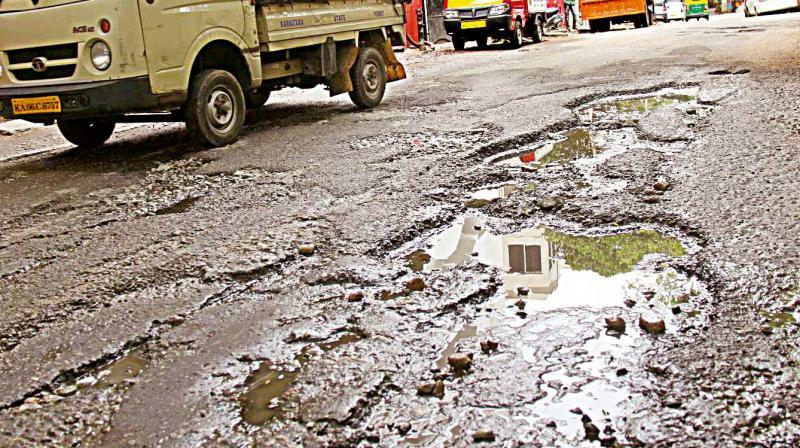 Surprisingly, nodal agencies do not even have an annual tender mechanism to take up road repair. The road is damaged at Banjara Hills Road No. 2; at Aramgarh road, specifically from the Owaisi Junction to Chandrayangutta Durganagar; Sarojini Devi Hospital to Madhur Sweets in Mehdipatnam; Malakpet; Nalgonda crossroads and Saidabad. Even though Transco completed work on Malakpet highway, and HMRL on the road under-bridge, six months ago, the agency was yet to take up road restoration. Mr Mohammad Iliyas said Transco completed cable-laying work about six months back and HRDCL authorities were yet to restore the road. This apart, he said the service road connecting the Nalgonda crossroads flyover was severely damaged and the road near Malakpet metro station was damaged severely because of HMRL works, for which restoration work was yet to be taken up. When queried about the same subject, a senior HRDCL official said on condition of anonymity that road repair work has not taken up because of severe funds crunch and skeletal staff. The official also said that the department does not have annual tender mechanism to take up road repair.